TS-POR-001 - Torque Solution Engine Water Pipe Repair Kit - Pann Auto Performance - San Diego largest aftermarket automotive performance parts - What do you drive? Torque Solution has brought to you an 8pc Coolant Pipe Repair Kit for all Porsche Gt1 Engines with Press fit and Glued coolant pipes.. These will fix the issue that plagues the Gt1 engine of water pipe failures resulting in coolant dumping all over the engine bay and possibly on to the rear tires causing you to lose control of the car. This issue can ruin a good track day, weekend or even worse cause you to have an accident on the street or on the track.. If you have your engine out of the car for any reason thats the best time to do the repair.. This will require the engine to be removed and the fittings welded in place.. 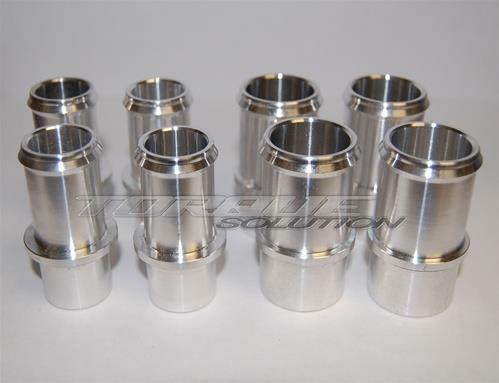 Giving you peace of mind knowing its done right with the weld on fittings..